This year, exhibitions of older art in the Netherlands seem to cater to a fascination with the rich and famous. The Rijksmuseum presented portraits of wealthy individuals from the past in High Society, ‘four centuries of glamour by the great masters of the history of art’. The audio tour featured commentaries by ‘society watcher’ Jort Kelder. An exhibition about medieval miniatures from the southern Low Countries in the Catharijneconvent emphasized their status as luxury items within the high culture of the wealthy elites. In the introductory film museum visitors could listen to Sander Schimmelpenninck, editor-in-chief of Quote, a magazine that yearly publishes a list of the 500 richest of the Netherlands. Alongside specialists in art history and manuscript studies, he was invited to compare the function of the manuscripts on exhibit to the consumption of luxury goods within current millionaire culture. 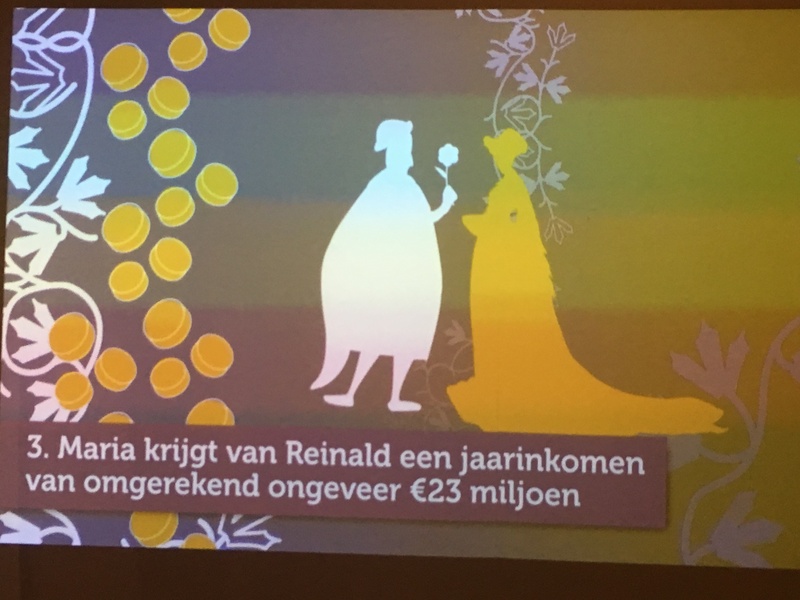 A current exhibition in Museum Het Valkhof in Nijmegen, titled Ik, Maria van Gelre (I, Mary of Guelders), seems to continue this trend. The makers of the exhibition compare the duchess Mary to Máxima, queen of the Netherlands: both are well-educated, come from another country to marry a ruler, and are confident women who take their position very seriously. Who was Mary of Gelders, why this exhibition and what image does it present of her and her time? 'Mary received a yearly income that could be translated to c. 23 million euros today from Reinald.' Mary presented as one of millionaires of the fifteenth century. Photo by the author. 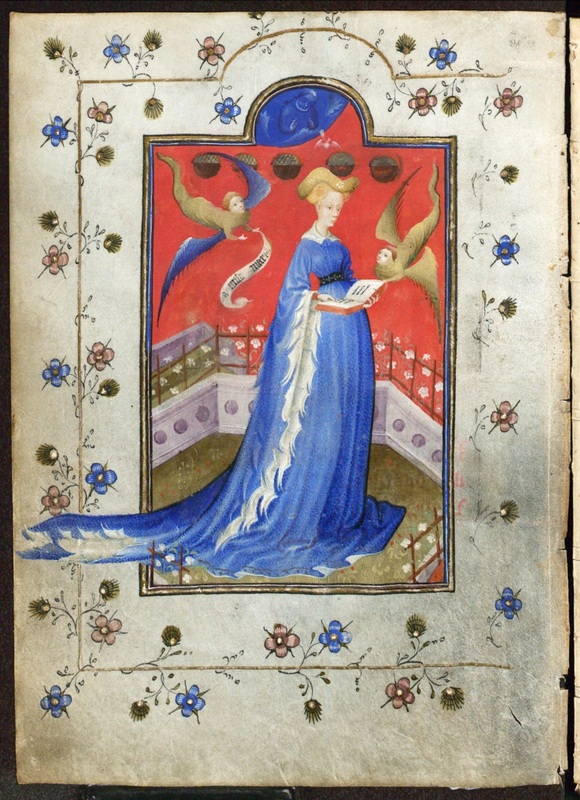 Mary of Guelders, not to be confused with the Queen of Scots who goes by the same name, would never have been the centre of an exhibition were it not for the extraordinary prayer book she commissioned. More than 1200 pages, the manuscript contains prayers in the vernacular of Mary’s new homeland and more than hundred miniatures. For decades this prayer books, kept in the Staatsbibliothek in Berlin, was ‘famous but unknown’, for it was inaccessible to both the public and researchers because of its bad condition. The manuscript was saved from oblivion by Johan Oosterman, professor of medieval literature at the Radboud University in Nijmegen. Through a successful crowdfunding campaign, he managed to attract money and attention for the restoration, research, and exhibition of this book. The most famous miniature in the prayer book: a portrait of Mary of Guelders (source). While several folios of the prayer book are shown in the exhibition, the main focus is on the life of Mary of Guelders. Born as Marie d’Harcourt in 1380 in Normandy, she was related to the French king and became lady-in-waiting at the court of Valentina Visconti and Louis d’Orléans. Age 25, she married the 40-year-old Reinald IV, Duke of Jülich and Guelders. It was an arranged, political marriage, aimed at producing an heir for Reinald. The exhibition gives an interesting view of both the opportunities and the precarious position of a medieval noble woman. On the one hand, Mary was part of courtly life, where she had servants, expensive clothes, jewellery, and other art objects (which can be admired in the exhibition), and plenty of food and entertainment. Moreover, she exerted political influence. She played a role in diplomacy by maintaining contact with other noble houses, for example with her family in France. Moreover, she sometimes took the place of her husband in political negotiations. A replica of Mary's dress at the exhibition. Photo by the author. On the other hand, Mary was married off and sent to region she didn’t know and where she didn’t speak the language. According to the marriage contract, the enormous dowry she took with her would have had to be paid back to Louis d’Orléans in case the marriage remained childless – which it did. After her husband died of illness while travelling in 1423, she was no longer welcome in Guelders. After three years Mary remarried, again for political reasons, to the 20-year-old Ruprecht, son of Adolf van Berg, who had a claim on the duchy of Guelders. She died a few years later. The exhibition does not only tell us about the life of this noble and rich lady. Especially when it comes to her devotional life, the visitor learns a lot about her wider context. An example is the importance of pilgrimages, in which Mary participated several times. She visited the convent in Renkum, founded by her husband, more than once. Renkum became a place of pilgrimage, which it still is today, after an images of the Virgin Mary with child descended from heaven into the chapel. 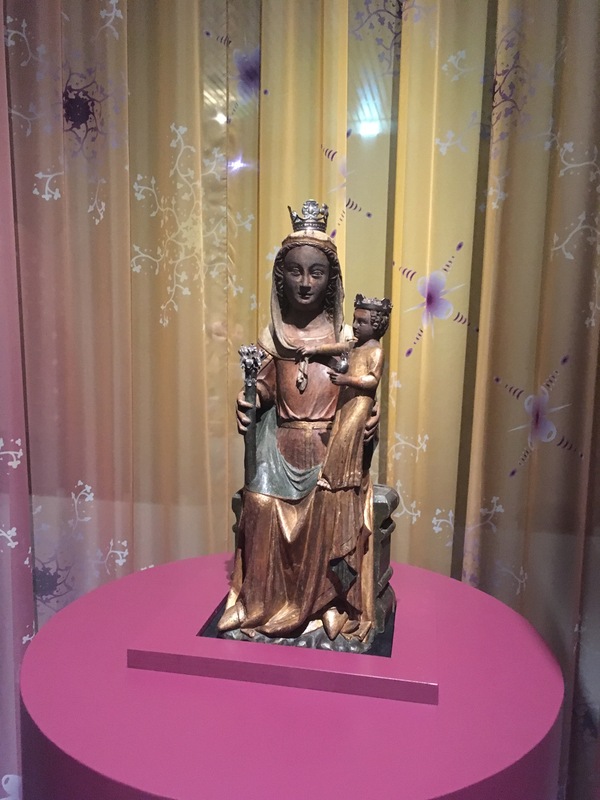 The exhibition features this beautiful sculpture of Our Dear Lady of Renkum. Visitors can also admire two pilgrimage badges: made of lead alloy, these objects were sold as pilgrimage souvenirs and thus spread in large quantities. Our Dear Lady of Rekum at the exhibition I, Mary of Guelders. Photo by the author. Mary’s life also touches upon the lives of her less wealthy contemporaries when it comes to the fear of illness and the ways people sought to protect themselves. Many of those remedies would now be regarded as superstition. Mary’s prayer book contained a prayer for the protection of her husband, with incantations and blessings. As the exhibitions shows, personal objects like amulets, relics, and rings with inscriptions were also used for protection against dangers such as the plague. Through these insights in devotional life, the exhibition does not only give an insight in Mary’s inner life, but also in the concerns of her time. This connects her with her contemporaries, who likewise sought salvation and protection from harm and illness. As such, the exhibition brings Mary to life as extraordinary ‘Maxima of the fifteenth century’, but also as a woman of her time, who despite an expensive prayer book could not protect her husband from dying on the road. The gift shop is also excellent! Photo by the author. The exhibition is showing from 13 October 2018 to 6 January 2019 at Museum Het Valkhof in Nijmegen. Don't forget to visit the St Nicholas chapel near the museum, which has a Mary of Guelders soundscape. For more information on Mary and her prayer book I recmmend the catalogue, available in Dutch and German: Johan Oosterman, Ik, Maria van Gelre. De hertogin en haar uitzonderlijke gebedenboek (Zwolle: Waanders, 2018). The many meanings of reading (3). Speed.